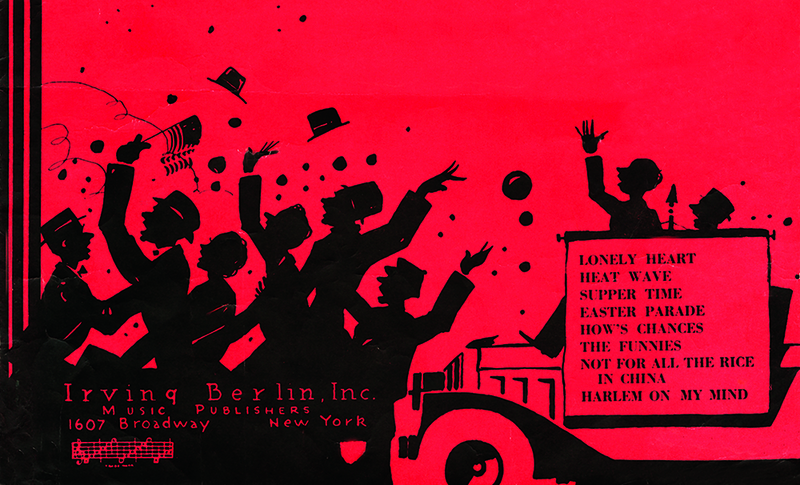 Illustration used on the cover of sheet music for the songs from As Thousands Cheer. The idea for As Thousands Cheer was broached to me by Mr. Berlin more than a year ago, before I had journeyed westward to the city of dreadful night known as Hollywood. We both agreed that we had no desire to do a conventional sort of revue with the usual blackout sketches, songs and dances. So we hit upon the idea of writing a topical revue right off the front pages of the newspapers. As Thousands Cheer opens with an extended triple-scene prologue before launching into its first sketch, “Franklin D. Roosevelt Inaugurated Tomorrow.” In November 1932—less than a year before the show’s opening night—Roosevelt, in a landslide, defeated the incumbent Herbert Hoover by 57.4 to 39.6 percent of the popular vote. The curtains open with the outgoing president (played by Leslie Adams) and Mrs. Hoover (Helen Broderick) packing up their belongings in the Oval Office on the eve of the inauguration—the last, as it happens, to occur on March 4. It was unheard of for a Broadway musical to portray still-living, real-life subjects, and (as Michael Kantor and Laurence Maslon point out in Make ‘Em Laugh) this scene was also “the first time an actual president was parodied in front of a live audience.” In fact, Berlin had originally composed a musical number for Helen Broderick with a chorus ending, “In a humbler place we'll have to dwell, / But a silk hat or a derby, / You will always be my Herbie, / And those twenty million people can go to hell.” It was dropped during rehearsals. Notes: On page 100 the Hoovers discuss Ogden Mills, Hoover’s secretary of the Treasury during the last year of his administration; he succeeded Andrew Mellon, who resigned after impeachment proceedings were begun against him in Congress. A few lines later, Mrs. Hoover mentions a medicine ball, used when Hoover played an arduous version of volleyball with his staff on the South Lawn of the White House; they became known as the Medicine Ball Cabinet. In the final section of the sketch, several members of the Hoover administration are lampooned. Charles Curtis was Hoover’s vice president and former Senate majority leader. Born and raised on a Kaw reservation in Kansas Territory, he was the first man with significant American Indian ancestry elected to national office. Dolly Gann was Curtis’s half-sister; when his wife died, she assumed the role of his social ambassador and created a scandal when she “pulled rank” over other congressional wives at state dinners and functions. Henry Stimson was secretary of state. As the sketch closes, the Hoovers sing lines from “Tony’s Wife” and “Fit as a Fiddle (And Ready for Love),” two songs popular during Hoover’s last year in office. Scene: The curtains part to disclose the famous “Oval Room” of the White House, which Mr. and Mrs. Hoover use as a sitting room to their bedroom. . . . If you don't see the full selection below, click here (PDF) or click here (Google Docs) to read it—free! This was a lot of fun. And I can just hear Helen Broderick. Thank you.